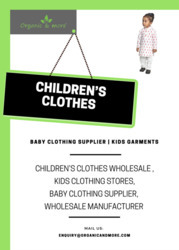 Over these past few years we have gained a good amount of experience in producing both knitted and woven toddler and children clothing with a lot of value addition work on them as well. We manufacture both Spring and Fall collections in Children’s clothes in a wide variety of fabrics. •Don’t forget to ask about our stock fabrics/colors/styles – these may help you save costs and time.